While there were virtually no surprises in today's FOMC statement - at least relative to expectations, with Goldman's redline statement laid out earlier a carbon copy of what the Fed eventually published - the oddly hawkish market reaction suggests that the Fed did in fact say something that was unexpected. To answer what that may be, here are several reactions from sellside analysts. 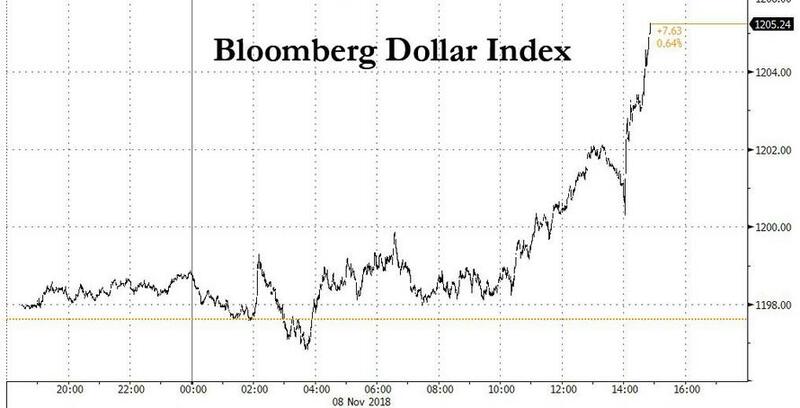 "Thursday’s FOMC statement further cemented expectations that the Fed will continue on its hiking path, which will contribute to upward pressure on front-end yields and help to flatten the curve in coming weeks"
“This hasn’t really moved the dial in terms of rate expectations. It doesn’t really do anything to dissuade the view that another hike in December is still quiet likely." Bleakley's CIO Peter Boockvar said the FOMC was a "snoozefest"
"If Fed Chair Jerome Powell’s aim was to avoid committing any views to paper ahead of a planned December rate hike, this statement was a success" says Boockvar, adding that it "could have been the most boring, dull and uneventful one I’ve read in a long time," interesting only in its omissions. “Nothing was said about tariff-induced higher inflation and certainly no mention of higher wages,” Boockvar wrote adding that "there was not one mention about the slowing housing and auto sector"
Citi's Fraser King agreed, saying the statement was a "non-event"
"As expected, no market moving changes from the Fed. Rates are on hold, everything is proceeding according to plan ahead of an expected December hike" King wrote. "In terms of the statement, very little has changed from the September 26 text"
One comment that stands out a litte: “Household spending has continued to grow strongly, while growth of business fixed investment has moderated from its rapid pace earlier in the year”. This is a little interesting (“rapid pace”) but the market probably isn’t that fussed about this nuance. Acording to King it is "worth highlighting perhaps that they did not refer to any financial volatility and refrained from communicating any decisions on operational issues" and finally "nothing here to suggest any risk to the expected December hike"
Reading between the lines it is difficult to explain the oddly hawkish response in the market, which has seen the BBDXY spike to 1205 while 10Y yields are just shy of session highs, if perhaps to note that Scotia may be closest: the Fed is telegraphing more hiking in the face of growing opposition from Trump.